The history of canals goes back to ancient times to the irrigation canals dating around 4000 BC in Mesopotamia, now Iraq and Syria. In Pakistan and North India, elaborate irrigation and reservoirs were constructed. And in Egypt and China, canals date back to 2332-2283 BC and 481-221 BC, respectively. The Hohokam people of current-day Arizona built canals around 500-1450 CE (current era). The deserts now encompassing the Phoenix area had a large prehistoric population, proving that canals were useful in sustaining life. But canals were used for more than possible drinking water and providing irrigation to crops. In the Middle Ages, travel by water was cheaper and faster. Early roads that washed out with the rains made for slow travel. Passengers wanting to relocate or trade with merchants could carry more goods by boat and arrive sooner. The downside was that travel was still slow; poles and oars meant manpower to move the boats. Night travel on rivers such as the Nile wasn't possible due to the risk of running aground on a sandbar. Still, seven mph was an improvement over trying to get your horse and favorite chariot out of the mud. When sails were invented between 2000-5000 BC, travel speed improved for canal and river boats, sometimes considerably, depending upon wind direction. During the 1700-1800s, ships would sail between Europe and America only when they were full, so scheduling regular trips became a priority. This was known as the Packet Trade, named for the mail packets they carried. In America, canal building began in the 1790s to connect the 16 States to the lands west for commerce, as well as for taking passengers and families wanting to relocate further west. Unknown to the colonists were the Hohokam's canals in a land they never dreamed of visiting. The 363-mile Erie Canal was built in 1825. The smaller packet boats, or later known as canal boats, were used to carry mail, cargo, and passengers using the canals and rivers. A packet boat was usually 14 feet wide to fit the narrow width of the canals, but could be anywhere from 70 to 90 feet long. The boat could carry up to 60 passengers much more comfortably, faster, and safer than a stagecoach, and it had sleeping berths for overnight travel. Packet boats were often pulled through the canals by a team of horses or mules who walked slowly along the bank. Passengers could cut their travel time in half by canal boat. One packet boat from Rhode Island named Hannah helped fan the flames leading up to the Revolutionary War. In 1772 a conflict broke out when Hannah was chased by the Gaspee, a British revenue schooner whose job was to collect customs fees and inspect any cargo coming into port. It ran aground pursuing Hannah. The colonists boarded the Gaspee the following morning and torched it, shooting one of the British officers. Another American packet boat that gained national recognition was The Marshall. It carried passengers from Richmond to Lynchburg, charging $8 for the 33 hour trip. It averaged approximately four miles per hour. There was a cook on board to prepare meals and there was separate lodging for men and women. In 1863 Confederate General Stonewall Jackson was shot at the Battle of Chancellorsville and died eight days later. The Marshall was used in the last leg of the journey on the James River from Lynchburg to Lexington, Virginia, to return him for burial. 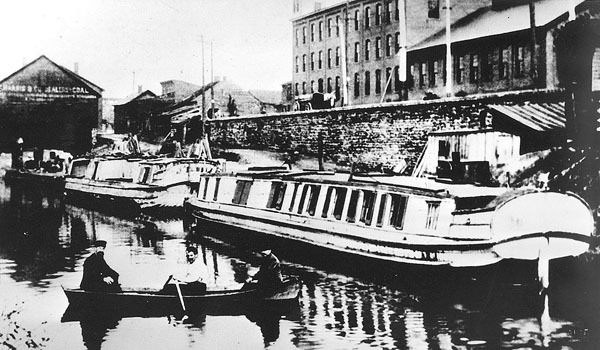 Canal and packet boats' heyday as the lead in transportation phased out in the 1870s, although some remained. Just as the packet boats were an improvement over wagon and horse travel, the canal boat was usurped in the 1870s when trains were at full steam. Trains offered a faster and cheaper way to travel, as well as a more economical way of moving large amounts of cargo. On occasion packet boats can be found at a historic site. In places such as Roscoe Village, Ohio, a 19th century village on the Ohio and Erie Canal, or in Georgetown, Washington D.C., on the Chesapeake and Ohio Canal, you can enjoy a boat ride pulled by draft horses or mules, and perhaps for a few moments you can go back in time to experience transportation by canal in a packet boat.